Following the latest demonstrations in Sokhumi, the President of the break-away region of Abkhazia, Alexander Ankvab, released an official statement through local media and said he tried to hold talks with opposition leaders to stabilize the situation, but the opposition categorically demanded his resignation as well as the dismissal of the cabinet of ministers and two district prosecutors. Ankvab said on May 27th, after an unsuccessful negotiation between him and the opposition leaders, demonstrators forced their way to the President’s administration building. In the statement Ankvab tried to clarify rumors about him fleeing from the region. “I have not gone anywhere. I am in Abkhazia and along with the Security Council we are discussing various ways these events might further development. The actions of me and my colleagues’ were aimed at preventing the implementation of a scenario which would bring irreparable harm to our country. A huge number of people, including armed men, went to the television building and they actually seized it… We still have a chance to return the situation to legal frameworks. Legally, it is, of course, an attempt to change the government by force," the statement says. Russian President Vladimir Putin’s aid Vladislav Surkov arrived in Sokhumi on May 28th to study the political situation in Sokhumi. 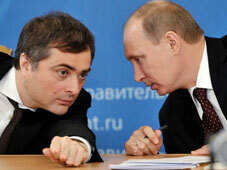 Abkhazian media sources inform that Surkov met with both sides but refused to make any comments to media sources. He had meetings with opposition leaders Raul Khajimba, Sergei Shamba, Akhra Bzhania, and Vitaly Gabnia, as well as with lawmakers in Abkhazia’s parliament. According to Khajimba, the opposition is not going to compromise and the resignation of Ankvab is the only way out. Opposition leaders created a Coordinating Council, which represents a group of four opposition political parties and seven public movements. The council currently controls the building of the president’s administration. Vitaly Gabnia, one of the members of the council explained to media that the Russian representative plays a role of a mediator between the parties and he does not interfere in Abkhaz political affairs. The situation still remains unsolved and parties are having a hard time achieving any consensus to solve the political tension. People are still demonstrating in Sokhumi. Supporters of the opposition are gathered outside the President’s administrative building. Supporters of Ankvab also gathered in the streets of Sokhumi. Both sides managed to hold rallies peacefully and no violent activities were recorded. Political standoff in Sokhumi has already attracted some international attention. Swedish Foreign Minister Carl Bildt responded to Abkhazian events on social network. “It was in 2008 that Russia by its war set up the so-called state of Abkhazia. Looks like a desperate mess now,” Bildt said in his tweet.